With the assistance of the Small Grants Foundation, a grassroots support group, Olivia Gude held meetings with leading community gardeners who’ve created such neighborhood gardens as Unity Park, Slumbusters, and the African Garden. 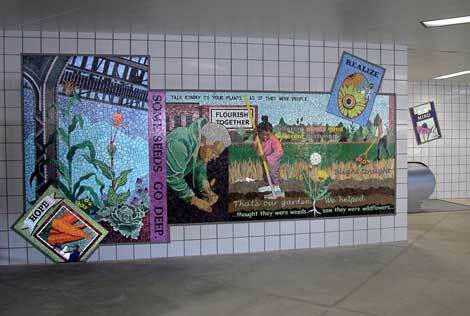 The images in the mosaic design are based on the snapshot photo documentation shared with the artist by these gardeners. Gude also met with third and seventh graders of nearby Crown Community Academy and explored their memories of and thoughts about the significance of their neighborhood’s gardens. The mosaic’s text sums up recurring themes mentioned by the gardeners and the children when describing the personal, social, and cultural significance of the garden projects. The mosaic was fabricated in a community mosaic workshop at St. Gregory Episcopal School, a few buildings away from the final installation site. The goal was to create another site for positive intergenerational interaction and to “plant the seeds” of mosaic making skills in the community so that locally made public art could become part of the garden making process. The image on the left of the mosaic shows stately corn and canna lily plants growing side by side in the shadow of the old CTA tracks. The image is a tribute to the vanished industrial grandeur of the original elevated train tracks (which the current building project replaced) and to the tenacity of the area’s gardeners who transform bits of idle land for multiple positive purposes. Food plants are grown in many of the community gardens—to enjoy the goodness of traditional homegrown food and to introduce urban children to the origins of the foods they eat. Other gardens are dedicated to creating oases of beauty in which generations can safely come together to relax and enjoy the outdoors. The artist deliberately did not include buildings in the background behind the canna lily and corn because when one visits these gardens the city recedes and the experience of nature predominates. The right side of the mosaic is “reality based,” showing a successful garden being created through the efforts of the adults and children who transform a weed and trash filled vacant lot into a beautifully tended public place. Three seed packets are “scattered” onto the mosaic. “MIND” (with a healing Echinacea flower) refers to knowing, to obeying elders, and to cultivating people and places. To “HOPE” (with a carrot) is to sense possibility even when it is not yet clearly visible. To “REALIZE” (with a sunflower) means to be in the sunlight of knowledge, to become aware, and to make happen through attentive care. Traditional and progressive values: faith, hope, and charity. Changing places changes lives. Changing perceptions also changes lives. This idea is referenced by the text that frames a dandelion growing in the still-to-be-reclaimed land at the front of the mosaic—“thought they were weeds…saw they were wildflowers.” Even when things in the environment aren’t perfect, one can be filled with joy, hope, and positive energy. Look at the gardeners of North Lawndale to know that this is true. the glowing green glass of the mosaic is a reminder that spring will come. the flowering and flourishing of North Lawndale.